Sony has recently discovered that, with certain units of its Digital Still Camera “Cyber-shot” DSC-T5 released on the market in Asia Pacific from August 2005, there is a small possibility that the metal plating on the bottom of the camera unit may warp outwards, causing a slight cut or scratch to the skin of the user when it is directly touched. To ensure customer satisfaction, Sony will offer one (1) free replacement of the bottom casing. We apologize for any inconvenience this may cause and your kind understanding and cooperation would be much appreciated. Sony continues to strive to improve its quality standards to the maximum extent possible. With certain DSC-T5 units, the metal plating peels away from the camera unit and warps outwards. Due to an irregularity during the initial part production, the adhesive strength of the metal plating declined. As a result, there is a small likelihood that damage to the bottom casing could cause the metal plating to peel and warp outwards. Digital Still Camera “Cyber-shot” DSC-T5. 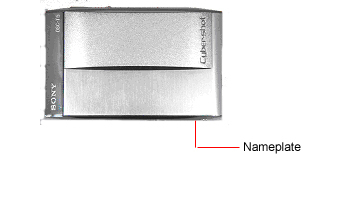 The model name and serial number are indicated on the nameplate at the bottom of the camera. Please confirm whether the model name and serial number is applicable. To determine whether your DSC-T5 camera may be affected in Asia Pacific region, click here to validate Serial No. Note: Although the metal plating of units other than the applicable serial number range may peel if dropped or exposed to other external impact, in these cases the plating would not warp. If you have further questions, please contact your local service centre. A list of the Sony service centres can be found in the Service Centres’ page. Personal information, such as your name and mailing address, provided to the contact above will be kept and used only for the above purpose. The information may be disclosed to the third party subcontractors that provide the free replacement service on behalf of Sony but will be strictly controlled and will not be used for any other purpose.